CAIDA hosts annual Active Internet Measurement Systems (AIMS) workshops to promote discussion between academics, industry, policymakers, and funding agencies on active Internet measurement, exchange of research ideas and questions that have been answered, or could be answered, with proposed measurement infrastructures. From March 1-3, 2017, CAIDA will host the 9th workshop on Active Internet Measurements (AIMS 2017) on the UC San Diego campus in La Jolla, CA. AIMS 2017 is by invitation only. This year we are imposing a limit on the number of registrants, and will close the registration when we have reached capacity. Registration closed. We have received an overwhelming response of registrants interested in attending, but as seats are limited, we have reached capacity and are no longer accepting new registrations. We will look back to assess the measurable progress achieved in each area and will propose the next steps forward continuing the advancement of Internet measurements. The workshop will run for 3 days (starting from Wednesday morning) with ample time for interactions between participants, breakout sessions, and collaborative discussions. Participants have 10 minutes to present and 5 minutes for quick questions. Deeper discussions will be postponed until after the group of related talks or during breaks. 10100 Hopkins Drive, La Jolla, CA 92093 is the nearest street address most GPSes/maps recognize. Parking legally is the attendee's responsibility. 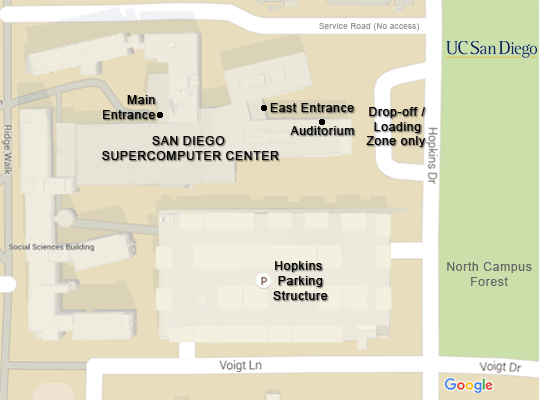 It is recommended you go to the Hopkins Parking Structure next to SDSC. Near the elevators will be a parking permit machine that will sell passes for $20/day. With a permit purchased in the Hopkins structure, you can park in any White " V ", Yellow " S ", or Green " B " spaces unless otherwise indicated. Please be sure to read the directions on the parking permit. Parking is limited. The penalty for an improperly parked car is at least $65 per day. We cannot be held responsible for citations issued for parking in an incorrect space or improperly displaying your permit.